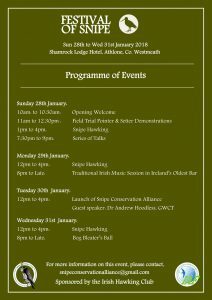 Come along to Ireland’s first Festival of Snipe, from Sunday 28th to Wednesday 31st January 2018, at the Shamrock Lodge Hotel, Co. Westmeath. The programme includes field trials demonstrations, snipe hawking, talks, and a Bog Bleater’s Ball. The Festival will include the official launch of the Snipe Conservation Alliance, on Tuesday 30th January from 12-4 pm, featuring a talk from Dr Andrew Hoodless, Head of Wetland Research at the Game and Wildlife Conservation Trust.